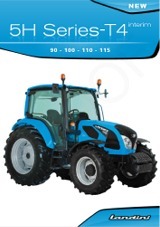 The Landini 5H Series has been updated, reinforcing its reputation as a jack of all trades. The key to the Landini 5 series’ success is the excellent modular transmission, with twelve each forward and reverse gears available on the standard model, through three mechanical speed ranges over four synchronised gears, as well as a hydraulically controlled PTO. The Techno and Top models in the range expand on this flexibility, with the optional creep transmission giving up to a maximum of forty eight forward and sixteen reverse speeds. Obviously this power control needs a source and Landini have wisely opted to base the 5 series around the new Perkins 1104D engine. These engines have been designed from scratch specifically for agricultural use by Perkins, with all of the pedigree you can only get from a company who have been building tractor engines since 1932. With a new hydraulic circuit system providing up to 82 litres per min of flow through four auxiliary spool valves, controlled with ease by lever controls, integrated in the right-hand console of the cab. This forms part of the redesigned, “total view” cab, giving comfortable and intuitive control of the tractor and implements along with excellent visibility. The Landini 5H Tier 4i Series is midway between the 5D, of which it inherits the cab and the wheel base, and the more structured Powermondial/6C Series featuring a 36 speed transmission with 3 powershift speeds. The pioneering technology featuring these engines provides significant improvements in terms of power, torque and fuel consumption. Available with a “manual” dry clutch or power shuttle, the 5H falls directly into the loader tractor category.